If there’s any one that knows how to save money in the kitchen, it’s me. I shared with my dad this weekend that it’s a little weird to referred to as a frugal living expert, since there are so many areas of my life that I just feel so inadequate in, but I have embraced the fact that yes, if there’s someone that can give encouragement about cutting expenses, I am your girl. I have lived it. I continue to live it and it’s finally really paying off, since there really is no such thing as small change. For most, the easiest area to see immediate results is in the kitchen. One of the biggest couponing complaints that people share with me is that they just don’t have “time” to coupon, or they are just too overwhelmed with cutting and organizing them. My organizational answer to that is fully covered in my Grocery Guru workshops, like just printing out some great salad dressing coupons to make it easy, but every once in awhile I just want to encourage and remind you, my lovely readers, that cutting your grocery budget in half begins without even using one coupon from home. One of the largest topics I cover here on my blog is actually cutting the food expenses and saving money without using coupons. If you need a quick little shot in the arm, spend some time perusing those posts. When I wrote 31 Days to More with Less, I also covered Easy and Odd Ways to Save money in the kitchen as well as some of the basic ways I budget for food . I offer many free printables to help you get more organized in that area because sometimes it is just hard to get started. But if you want to get started, it begins with using those Grocery Guru “Eagle Eyes,” as I lovingly refer to them. I can’t just pop in a grocery store. I have to attack it with my Eagle Eyes, and that can be done very quickly for me. I scan for those unadvertised deals because 3/4 of my grocery trips, they are there. Last night is a perfect example. We are holding a cookout for my son’s graduation party and I honestly did pop into our local store just for their great hanging plant basket price of 2/$10. But since I had an extra five minutes I decide to quickly scan for any deals that might help me for the party and I totally hit the jackpot. Here’s the kicker, most people never ever see these deals because they aren’t looking. First, I always look for marked down produce, meats and dairy. I scoured with a few gallons of milk. Next, the soda was BOGO Free, so I stocked up on some specifically for punch. 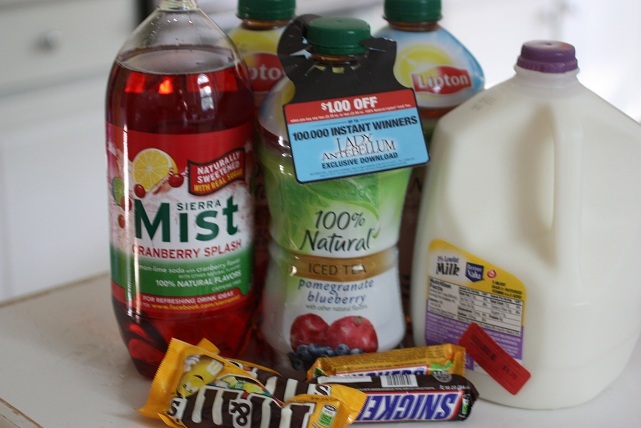 Third, the Lipton Iced Tea were also BOGO (Buy One, Get One Free), AND there were hang tags on the drink for an additional dollar off of two. PERFECT! Since I can use three like coupons, I purchased six drinks, received an additional $3 off and ended up with those yummy Lipton iced teas for only $0.75/piece. Another perfect drink for the party. Lastly, and the best part was the candy. They were right at the check out for $1.09 for one, BUT they were on sale BOGO making them $0.55. Here’s the kicker. Stuck to the end cap were coupons for $0.50/2. Now, do the math. At this store, they double coupons, so that made the coupon worth $1. I scored 2 candy bars for $0.9. Since I can use 3 coupons, I bought 6 candy bars, and you can believe I will be going back in today. They will be perfect for some Snicker type of dessert for the party. So make sure and use those Eagle Eyes every time you shop. Just that one tip can save you lots of money. All of these concepts I cover in my Savings Nation Grocery Guru/Ten Minute Dinner workshop (partnered with Savings.com). If you are within driving distance, I would love to come to you. If you are interesting in hosting a Saving Nations Meal Planning & Coupon Class, fill out my info form. Love those finds! Thanks for sharing! I just made a Snicker apple salad on Memorial Day using leftover Snickers from Easter clearance. It was a hit. It’s just chopped Snickers, diced apples, whipped cream and cream cheese. Super easy and yummy! We’re having a cookout on Saturday as well for my boys’ birthday. Haven’t decided on sides yet but I’m going to grill Polish sausages that I got for under $1. Also, got free pasta to make salad and Breyer’s ice cream for $.50. Love when you can save on food for parties. Joy – that Snicker salad sounds so yummy!!! I am scrambling to come up with desserts for our party on Sunday. Did you just whip the cream cheese and whip cream together? @Jen, Yes, just one brick of cream cheese softened and two tubs of Cool Whip whipped together. You can use more or less Cool Whip depending on taste. Then, I just diced four large apples and soaked them in a little lemon juice and chopped one bag of Easter fun size Snickers. A little bit goes a long way with this salad because it’s so decadent. You can use any kind of apple, green or red. I used Empires. Leave peel on for color. I just want to thank you for your blog. You encourage, lead, and inspire. What inspires me most is that you do this with the Heart of Christ, which is evident. I would love to meet you sometime. I am sure that we would become fast friends, as we have much in common. Thank you again. Is there a time of day or a day of the week that markdowns are most likely to be avaliable? Ohhh, my eagle eyes were working tonight!! I scored split-breast chicken $0.49 a pound, marked down milk and bananas, GREAT price on EVOO and Finish tabs at Ingles! I’ve got 5 kiddos, so if I see “sharpy-marker milk”, it goes in the cart!! A 5lb bag of browning bananas for $1.50 makes me a happy mama. I may have gone a little overboard with the chicken (30 lbs yikes! ), but for the price I just couldn’t pass it up. We also scored an awesome deal at Sam’s Tues. 3 boxes of yogurt (2 12count Greek yogurt w/ fruit and 1 24 Dannon) for not $36 but $3!!!! Yes it is short dated (June 1), but the youth group loved it Wed. and we’ll be eating LOTS of fruit smoothies!! Love, love, love finding deals like these!! Oh girl – you CLEANED HOUSE!! So fun, and that chicken breast for that price? Amazing. I would have gone overboard too. Now you will have to share with me what you decide to make with it all. I have never seen marked down at our Sam’s, but I am going to ask the next time I am there. That would be wonderful to get that on dairy. We love smoothies. I want to let you know that I really have learned a lot from your blog. Awesome tips. On our last shopping trip I asked my son to get a package of Italian Sausage, which at $5.48 for 10 is not a bad price, but he came back with 4 packages and excitedly told me that they were clearanced at $2.74 each, and the best by date was still days away. My kids are learning to have the “eagle eye”, too! So fun, Annie!! You have to love when kids get excited about savings. Thanks for your sweet words. Great post, Jen! It’s true that Eagle Eyes do spot the best bargains. I just found bags of Sister Schubert rolls clearanced at Kroger, down to $1. Since they are normally, $4.09 a bag, I knew this was a great deal. I quickly pulled out two coupons that I had with me, and lowered the price to $0.65 a bag. Love bargains like these…and hearing that I’m not alone in this frugal excitement!